Is Gardner still the quarterback, or will Al Borges see Morris as the big-armed pocket passer that he wants for the pro-style offense he badly wants to implement? Michigan limps to the finish after a 5-0 start, losing five of its final seven games and Devin Gardner along the way. A win over the Wildcats wasn’t even the important thing. After a 7-5 regular season that Brady Hoke often blamed on having such a young team, the Wolverines just needed to show that their underclassmen were getting the hang of things — that they had taken steps forward in month between the Ohio State loss and the trip to Arizona. That didn’t happen. Freshman quarterback Shane Morris looked promising in a first half that saw him throwing quick passes, screens and forward tosses in the backfield, but struggled when asked to do more in the second half. "I feel like Shane held his own," said wide receiver Jeremy Gallon. "We didn’t help him, because we didn’t play the way we are expected to play and we didn’t play the way we prepared to play." Morris certainly couldn’t take all of the blame, though, as the offensive line continued to play below expectations, and the running backs failed to make plays where holes didn’t exist. Morris, hardly a Denard Robinson/Devin Gardner-style runner, led the Wolverines with 43 yards rushing, nearly all of it coming on a long scramble in the final minutes of the game. Tight end Devin Funchess was second with 14 yards, all on one end-around. Michigan’s actual running backs did nothing to sort out the confusion as to who should be the number-one back for 2014, as four of them combined to carry the ball eight times for 13 yards. Derrick Green, who went into bowl season as the apparent starter, only touched the ball once, while fellow freshman De’Veon Smith got four carries for seven yards. "Running the ball has got to be a premium for us, and we just didn’t do that well enough," Hoke said. "That’s always a big factor." With Gallon and both offensive tackles leaving, including All-American Taylor Lewan, the Wolverines go into next season with question marks at almost every position. Is Gardner still the quarterback, or will Al Borges see Morris as the big-armed pocket passer that he wants for the pro-style offense he badly wants to implement? If Morris gets the job, would Gardner stay as a wide receiver or would he take advantage of a little-used NCAA rule that lets players in graduate school transfer without having to sit out a year? None of what Borges wants to do can work without a strong offensive line, something that was a complete failure this season. Lewan and Schofield, both recruited by prior coaches, kept the edges of the line protected, but none of the young offensive linemen took advantage of the opportunity to grab a spot inside. That meant, as the Wolverines were losing six of their last eight games, a constant stream of disruptive pressure up the middle that destroyed both the running and passing attacks. Now they have to fill all five offensive-line spots without having a single player who has shown the ability to be an unquestioned Big Ten starter. If they can’t do that, the battles between Green and Bell or Morris and Gardner might not even matter. While Borges — or a new offensive coordinator if he is let go — struggles with rebuilding his side of the ball, things aren’t a lot better on the other side. Kansas State — a team that finished 37th in the NCAA in offense — moved the ball at will against the Wolverines, continuing the pattern of recent games. Defensive coordinator Greg Mattison came into the game knowing that Kansas State liked to run the ball behind tailback John Hubert and their quarterbacks, while the one big passing threat was Jake Waters to Tyler Lockett. Despite that, Michigan couldn’t take any of those weapons away. Lockett caught three touchdown passes in the first half, and only missed out a fourth when he dropped an easy catch in the end zone. Hubert, Waters and backup quarterback Daniel Sams rushed for 145 yards and another score as the Wildcats were only forced to punt once. Michigan was actually lucky to only lose 31-14 — Kansas State missed a short field goal and had the touchdown pass dropped in the end zone, while the Wolverines didn’t get their only touchdown until the final 90 seconds of the game. 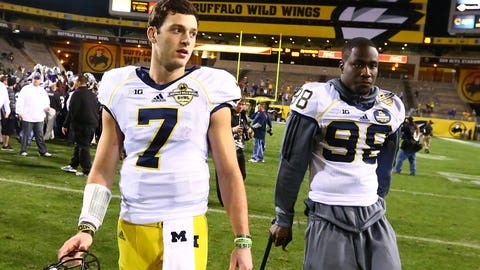 Even then, after Fitzgerald Touissant’s three-yard run, the Wolverines did one last thing to exasperate their fans. On the two-point conversion, Morris flipped the ball to Gallon, who ran an end-around before pulling up to hit a wide-open Justice Hayes in the end zone. It was a clever play, but one that might have been better used on the game-deciding 2-point conversion against Ohio State than on a meaningless play at the end of a bowl-game loss. Michigan goes into the offseason with a lot of highly-recruited players, but not many that have lived up to expectations. If the coaching staff can’t find a way to bring that potential out of a large number of players, things could get ugly in Ann Arbor next fall.